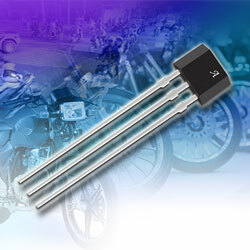 Allegro Microsystems Europe has released its A17301, a new Hall effect sensor IC perfect for two-wheeled vehicles, especially in position and timing applications like speedometers and tachometers for engine control. Integrating EMC components into a small SIP package, the device is a strong solution for digital ring-magnet sensing or ferromagnetic target sensing when coupled with a back-biasing magnet. This new device removes the necessity for external filter capacitors while enhancing reliability and decreasing the cost of a final sensor assembly. The IC incorporates dual Hall-effect elements with 2.2mm spacing and signal processing that switches in response to differential magnetic signals.